Even though we've already got a ton of baby/kid gear, this new baby we're having in July does present some twists to the kid-gear needs. The first and foremost in my mind is (of course) - how will this affect my Bugaboo? So the Bugaboo only will stroll one kid at a time (obviously), and by the time the new baby arrives Madame will be barely two years old. Short of getting a new double-wide stroller there aren't many options. 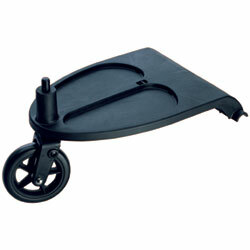 Bugaboo does offer this "wheeled board" attachment (pictured). The idea is the kid stands on it, in front of you and facing forward; and kind of rides while holding on. I've never seen one used, and right now it's pretty hard to imagine Madame standing still on the back of a stroller while it's moving. Has anyone used this attachment (or even seen someone who was using it)? Please leave a comment if you have. I'd be really interested to know. Get the Bugaboo Wheeled Board for $79.95 from Amazon at the new Modern Day Dad Store.